Many of you have probably read my earlier blogs on bandboxes so I won’t elaborate on their purpose. They were originally designed to store and transport men’s removable collar bands, hence the name, but they were also used for hats and as general carry-all’s. Many boxes in the 1830s and 40s commemorated historic events of the period, with advancements in transportation a popular them. These included horse-drawn trains and early steam boats, while today I’m blogging about a historic balloon launch. I am always amazed that so many of these pasteboard boxes have survived, given the rigors of stagecoach travel, not to mention fires and vermin. 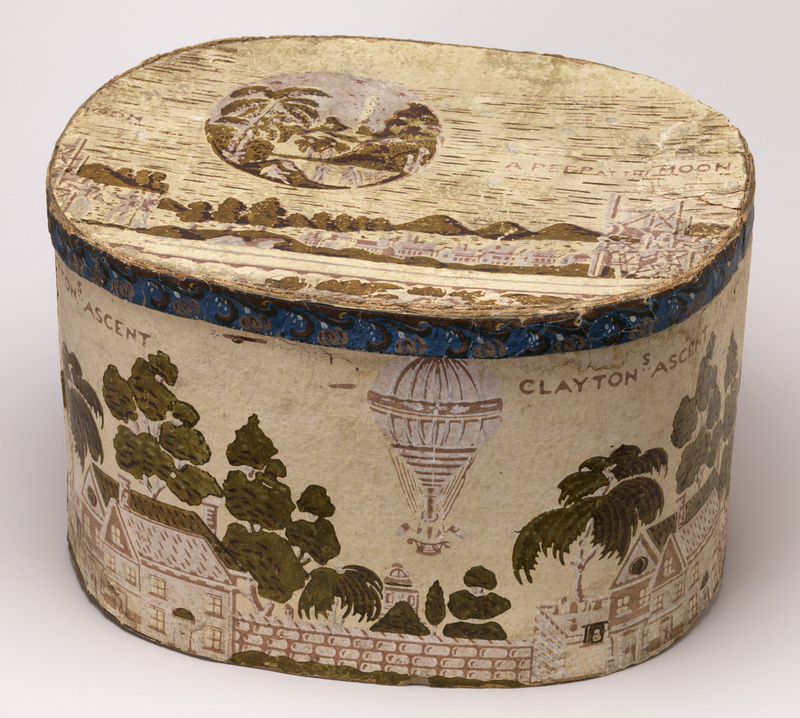 Titled Clayton’s Ascent, this box commemorates a historic balloon launch set by Richard Clayton in 1835. Clayton was a watchmaker by trade and enjoyed a hobby of ballooning. On April 8, he flew his hydrogen balloon “Star of the West” 350 miles from Cincinnati, Ohio to Munroe County, Virginia in just over nine hours, breaking the previous record of 311 miles. There are numerous newspaper articles documenting his balloon exploits, many of which were not so successful. The box lid, presumably not the original, though they have been together for 100 years now, tells another interesting story. This is called “A Peep at the Moon”, and if you zoom in on the image you can catch a glimpse of some winged figures next to the palm trees. Some things never change: we’re still fascinated by space travel, and we’re still looking for signs of life on other planets.